Fetch is excited to be at the Great Lakes Pet Expo this Saturday, February 1. Please be sure to stop by our booth in the lobby (across from the ticket booth). We will have not only the latest issue but also back copies of previous issues which are always in high demand. We love our readers so please stop by for a free chance to win a reader gift basket. And to let us know how much you love Fetch! For details on the Great Lakes Pet Expo go to www.petexpomilwaukee.com. As soon as their owners put down a bowl of food, many dogs feel the need to inhale their meal as quickly as possible. Dog Games®, the trusted brand of innovative puzzle toys, is hoping to slow down dogs’ eating habits while making mealtime more fun with its new line of Slo-Bowls™. Available in multiple colors and designs, these slow feeders require dogs to forage for every bite, resulting in a healthier, more balanced meal. Because their wolf ancestors were accustomed to scavenging for food, dogs today woof down their dinner in a matter of moments, which causes a number of health and digestive issues. Bloat, which kills around 20,000 dogs every year, is typically attributed to rapid eating. Dogs that eat too fast also tend to overeat, which has led to increases in canine obesity. Being overweight, in turn, increases a dog’s risk for cardiac disease, heat stroke, and respiratory illness. Veterinarians across the country agree that slower feeding is safer feeding. Designed to prolong eating times and put the brakes on overeager eaters, the Slo-Bowl™ (MSRP $24.99) allows dogs to eat the healthy way while reducing the risk for bloat, regurgitation, and canine obesity. However, unlike bowls that simply hinder a dog’s ability to eat, this new dish actually makes a game out of gorging. Dogs learn to “chase” their food through a maze of ridges and valleys, which makes dinnertime feel more like a hunt. And, because the Slo-Bowl™ “rewards” their play with bits of food, dogs become more and more engaged as the meal goes on. Along with giving owners peace of mind by promoting healthier eating habits for their four-legged friends, Slo-Bowls™ also have features that humans will appreciate. Free of BPA, PVC and Phthalates, Slo-Bowls™ can be easily washed in the top rack of the dishwasher and also feature rubber-molded foundations that prevent sliding and food spillage. Beginning October 10th, dog owners can purchase Slo-Bowls™ online or at local and national pet specialty retailers. To learn more about the new Slo-Bowls™, please visit http://www.slo-bowls.com/. Dog Games® is one of four brands offered by Kyjen, a Colorado-based company that designs unique products to keep dogs active and engaged. Dog Games® Puzzle Toys challenge dogs and stimulate their senses with boredom busting, mental exercise! Products include agility kits, plastic games and puzzles, rubber games and puzzles, ball launchers, exercise games, and slow feeders. http://www.doggamespuzzletoys.com/. Dogs were domesticated between 9,000 and 34,000 years ago, most likely while humans were still hunting and gathering – before the advent of agriculture, according to an analysis of individual genomes of modern dogs and gray wolves. Cornell University researchers Ilan Gronau, Adam Boyko, Adam Siepel and an international team of researchers published their report in PLOS Genetics, Jan. 16. The researchers studied genomes of three gray wolves, one each from China, Croatia and Israel – all areas thought to be possible geographic centers of dog domestication. They also studied dog genomes from an African basenji and an Australian dingo; both breeds come from places with no history of wolves. Computer methods for analyzing complete genome sequences developed by Ilan Gronau, the paper’s second author and a postdoctoral associate in Siepel’s lab, played a key role in the collaboration. Gronau’s computer program, called G-PhoCS, was previously applied with success in a 2011 Nature Genetics study of early human history and demographics. In this case, G-PhoCS provided a detailed picture of the demographic changes that occurred during the divergence of dogs from wolves. The analysis revealed that domestication led to sizable pruning in population of early dogs and wolves. Dogs suffered a sixteenfold cut in population size as they diverged from an early wolf ancestor. Gray wolves also experienced sharp drops in population, suggesting that the genetic diversity among both species’ common ancestors was larger than represented by dogs and modern wolves. In addition, there was considerable gene flow between dogs and wolves after domestication. Accounting for gene flow was a major challenge in the analysis, and Gronau’s research on this topic proved valuable in obtaining an accurate model of canid demography. The picture emerging from this study will allow researchers to better interpret genetic differences observed between dogs and wolves and to identify differences driven by natural selection. “This paper sets the stage for the next step in the study of dog domestication that tries to determine the genetic changes that enabled this amazing transformation,” Gronau said. The study’s senior authors included geneticists John Novembre at the University of Chicago and Robert Wayne at the University of California, Los Angeles. Adam Freeman, a postdoctoral fellow at UCLA, was the paper’s first author. The study was funded by various sources, including the National Science Foundation, National Institutes of Health and Life Technologies. Congratulations to Pooches and Purrs Cooperative for winning the third week’s contest from PetFirst. The rescue agency receives a $50 gift card to use for supplies needed for the animals in their care. Pooches and Purrs Cooperative is a licensed transport. Their efforts enable volunteers to deliver dogs and cats to various locations in Maryland, Pennsylvania, New York, Connecticut and New Hampshire where their new families pick them up directly from USDA approved drivers. Transports begin in Scottsboro, Ala., as well as Chattanooga, Cleveland, Knoxville and Kingsport, Tenn. The pets are transported to families in the New England area in cities such as Hagerstown, Md., Allentown/Fogelsville, Pa., as well as Darien and Plainfield, Conn. The contest is open to all animal shelters and rescue agencies and provides up to six chances to win throughout the month of January. Weekly winners, such as pooches and Purrs Cooperative, will win $50 toward the purchase of materials needed for their shelter. At the end of the month, PetFirst will draw a grand prize winner of $250 from all the shelters and agencies who participated in the contest. Adopters can receive coverage by calling 877-291-7387 or visiting http://petfirst.pr-optout.com/Tracking.aspx?Data=HHL%3d%404%3a%2f.CP%3f%401%3f2%3f232.LP%3f%40083%3a&RE=MC&RI=3810165&Preview=False&DistributionActionID=81&Action=Follow+Link. PetFirst is the fastest growing pet insurer in North America offering easy-to-understand lifelong coverage for dogs and cats. PetFirst’s comprehensive coverage is unique in the industry providing simplified policies with coverage for hereditary, chronic and breed-specific conditions with no per diagnosis limits. PetFirst offers pet insurance in all 50 states and the District of Columbia through animal welfare agencies, retailers, employers as well as other partners. PetFirst polices are underwritten by American Alternative Insurance Corporation (Munich Re) which is rated by A.M. Best as A+. Additional services are underwritten by Lloyd’s. For more information about PetFirst pet insurance, visit http://petfirst.pr-optout.com/Tracking.aspx?Data=HHL%3d%404%3a%2f.CP%3f%401%3f2%3f232.LP%3f%40083%3a&RE=MC&RI=3810165&Preview=False&DistributionActionID=80&Action=Follow+Linkor call 877-894-7387. The Krewe of Barkus and Meoux’s 16th Annual Pet Parade will march through RiverView Park, 601 Clyde Fant Parkway in downtown Shreveport, La., on Sunday, Feb. 23. The theme of this year’s parade, “A Wonderland Tea Pawty,” suggests that spectators and participants are likely to be surrounded by countless dogs, cats, ponies, bunnies and more dressed as characters from the story Alice in Wonderland. Registration and events begin at 1:30 p.m., with the parade procession scheduled for 3 p.m. More than 500 elaborately-costumed pets took part in the 2013 event, and event organizers estimate that between 500 and 700 animals will participate this year. For the first time in Krewe of Barkus and Meoux history, the “animal krewe” will be led by a four-legged Grand Marshall. “Mr. Kippers,” an English bull terrier who was rescued from an abusive home environment and adopted by a Shreveport family, will serve as the Krewe of Barkus and Meoux’s Grand Marshall. Mr. Kippers’ adoptive owners, Gordon and Amanda Clingan, have launched a line of bowties called Classic Kippers, with all proceeds from bow tie sales benefiting organizations that aid abused and neglected animals. Registration fees range from $10-$20 per pet, with a $5 discount for those who pre-register. Pre-registration for the parade is open through Feb. 21 at http://www.animalkrewe.org/. On-site registration will also be available on the day of the event. All proceeds from pet registration will benefit Shreveport-Bossier’s abused, neglected and homeless animals. All members of the public are welcome to participate, whether by registering their pets to walk in the parade or by attending the event as spectators. For more information on upcoming Carnival season festivities in Shreveport-Bossier, visit www.shreveport-bossier.org/mardigras. For more information on the Krewe of Barkus and Meoux, visit http://www.animalkrewe.org/. 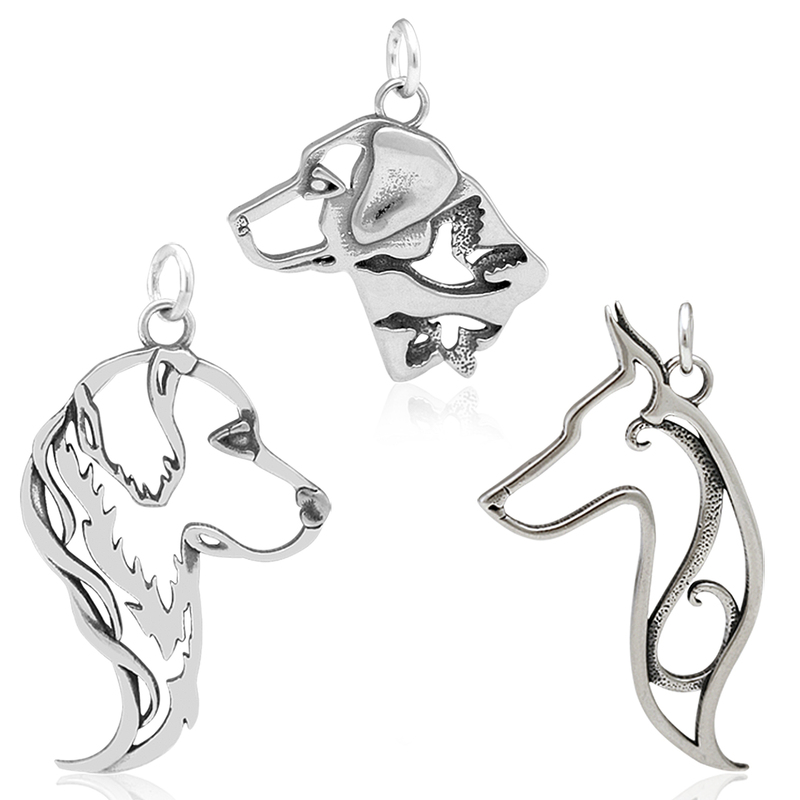 Dazzling Paws Jewelry has announced the newest addition to their distinctive dog themed Sterling Silver jewelry collection; the product line extension of authentic, specific Dog Breed Jewelry offering designs made especially for people who love dogs and specifically their breed! The first seven Sterling Silver Dog Breeds are: “Australian Shepherd”, “Doberman Pinscher”, “German Shepherd”, “Golden Retriever”, “Labrador Retriever”, “Pembroke Welsh Corgi” and “Shetland Sheepdog.” Plans are in the works for more designs to satisfy the enthusiastic demand for special breeds that speak directly to the heart of passionate dog lovers. Designs are available in pendant and earring sets featuring a head study or full body pose for each breed. Dazzling Paws Jewelry LLC is dedicated to providing high quality designer dog themed jewelry for people who love dogs. Dazzling Paws Jewelry is 100% handmade in the USA from Recycled Sterling Silver. The Dazzling Paws Jewelry line includes: Dog Sports like Agility, Obedience, Rally, Flyball, Dog Breeds, Build-Your-Own Letter Line, Pet Memorial Jewelry, Semi Precious Stone Collection and Dazzling Canine Bead Designs. Sterling Silver jewelry designs include: rings, earrings, beads, pendants, pins, charm holders, chains, and bracelets. For more information or about Dazzling Paws Jewelry visit www.dazzlingpawsjewelry.com or call: 715.345.1314 CST. Old man winter has blanketed most of the US for the past several weeks. As if one Polar Vortex wasn’t enough, a second Polar Vortex system has brought sub 0 temperatures to many states for a second time in the less than a month. PetFirst offers a few tips on caring for your pet during the winter months as we patiently await the arrival of spring. How can I make sure my pet stays warm? Bringing your pet indoors and making sure they have a warm, cozy place to sleep away from drafty winds is the first step. Providing your pet with plenty of cushion, either in their own bed or with pillows and blankets will allow them to keep their body temperature regulated and get plenty of shut-eye. For those that keep a short hair cut on our pet, never shave your dog during the winter months and allow them to sport a longer coat. It will keep them warmer. If you have a short-hair breed, think about purchasing a sweater or coat that covers their mid-section to the base of their tail. While some pet owners consider this fashion statement fun, many consider it a must for function to prevent their pet from being uncomfortably cold during winter months and outdoor activities. Can I continue to bathe my pet outside? No, it is time to bathe your dog indoors. Dogs are more susceptible to catching a cold in the winter months, as well as suffering from hypothermia or frost bite, so utilizing your bathroom to bathe and groom your pet is necessary. Consider turning up the heat in the bathroom and checking the water temperature after you have filled up the tub. Dogs can suffer burns from hot water, and they will be much more cooperative if the water is a comfortable temperature. Also, investing in a non-skid mat for the bottom of the tub will be money well spent. A bathtub’s slippery surface can cause dogs to panic and make bath time even more challenging. Prior to bathing your dog, brush out all mats and excess fur. This will prevent fur from clogging your drain. Be sure to use a dog shampoo, and be weary of getting it in their eyes. Rinse out the shampoo thoroughly, and try to keep water out of their ears as much as possible to prevent infection. Utilize your hands as a squeegee to remove excess water, then towel dry. After your pet is dry, you will want to brush them again to remove any fur that was loosened during the bath. Never let a pet outside that is damp or wet; make sure your pet does their business prior to getting a bath and is let out only after being completely dry. How do I protect my pet from chemical hazards during the winter? Snow and ice are usually combated with chemical compounds created to melt the ice. Those chemical compounds also pose a real danger to pets. Be sure to clean your pet’s paws and underbelly after being outside to prevent burning and irritation. Remove all the snow and ice, especially in between the pads of their feet, to prevent licking and ingestion of any chemical. Antifreeze poising in pets is a very common occurrence during winter months. The sweet aroma and taste is inviting to pets, but ingestion can endanger your pet’s life and cause serious kidney damage. To protect your pet, keep antifreeze sealed and out of reach. Never allow your pet to wander unattended near roads, driveways and in garages or sheds where they could come in contact with antifreeze. To lessen the threat of antifreeze poisoning, choose a brand of antifreeze that contains propylene glycol, which is less toxic, instead of containing ethylene glycol. If you suspect your pet has ingested antifreeze, get them veterinary care immediately. Treatment in the first few hours is critical to your pet’s survival. Do I need to continue flea, tick and heartworm prevention during the winter months? Yes, it is imperative that pet owners continue to treat their pets with preventative medication during the winter months. Heartworm, as well as flea and tick preventatives should be given to pets year-round. Heartworms are more commonly found in dogs, but can be fatal to both dogs and cats. Heartworms lodge themselves into your pet’s heart, lungs and pulmonary arteries where they cause severe health issues and may even result in death. Mosquitoes are carriers of microscopic heartworm larvae, which can be spread to your pet with just one bite. During the winter months when mosquitoes are scarcely seen outdoors in cold climates, they survive in places such as garages, basements and sheds. There are many effective heartworm preventatives on the market that can help protect your pet during these months when the threat of contracting heartworms is still present. Just like mosquitoes, fleas and ticks can also survive the cold winter months. They can house themselves not only on your pet and outdoors, but also in bedding and carpet. These insects can be carriers of life-threatening conditions such as Lyme disease, murine typhus, plague, Rocky Mountain spotted fever and others which can affect your pet and your entire family. To protect your pet and your home, treat your pet with a monthly preventative as well as treating your environment. Vacuuming carpet prior to applying environmental flea and tick preventatives will help pre-adult fleas to come out of hiding, making them easier to target. Ask your veterinarian to recommend a product that contains an insect growth regulators (IGR) that will prevent maturation of eggs, larvae and adults. Can flu season affect my pet? While parents know winter brings several bouts of runny noses and coughs, many overlook the effect of flu season on their pets. Canine influenza was discovered several years ago and poses a severe threat to all dogs, especially those with flat noses, such as Shih-Tzus, Pekingese and Pugs. Dogs have not had the chance to build up immunity to the disease, thus putting them all at risk. Most dogs that contract this virus show mild symptoms, such as a cough, runny nose and fever, however, more severe cases can develop pneumonia and ultimately lead to death. As with the flu in humans, canine influenza is easily spread. It can be spread by direct contact with an infected dog, by contaminated objects and also by humans who have been in contact with an infected dog. Canine influenza is able to be diagnosed and is treatable with responsive care of medication and fluids. Though winter does present new dangers for your pet, it can also be a very enjoyable time of the year. Whether it is playing in the snow with your furry friend or snuggling by a fireplace, you and your pet can the most out of winter months by preparing for the change. To learn more about caring for your pet during the cold weather and other helpful tips, visit http://petfirst.pr-optout.com/Tracking.aspx?Data=HHL%3d8%2b37%3c%26JDG%3c%3a793%3a%2f%3b%26SDG%3c90%3a.&RE=MC&RI=3810165&Preview=False&DistributionActionID=102&Action=Follow+Link. PetFirst is the fastest growing pet insurer in North America offering easy-to-understand life-long coverage for dogs and cats. PetFirst’s comprehensive coverage is unique in the industry providing simplified policies with coverage for hereditary, chronic and breed-specific conditions with no per diagnosis limits. PetFirst offers pet insurance in all 50 states and the District of Columbia through animal welfare agencies, retailers, employers as well as other partners. PetFirst polices are underwritten by American Alternative Insurance Corporation (Munich Re) which is rated by A.M. Best as A+. Additional services are underwritten by Lloyd’s. For more information about PetFirst pet insurance, visit http://petfirst.pr-optout.com/Tracking.aspx?Data=HHL%3d8%2b37%3c%26JDG%3c%3a793%3a%2f%3b%26SDG%3c90%3a.&RE=MC&RI=3810165&Preview=False&DistributionActionID=101&Action=Follow+Link or call 877-894-7387.